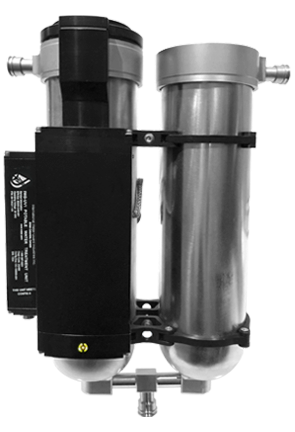 The IWG-UV1 is the newest water treatment unit to IWG’s product family – simply stated, it is a dual action unit that filters and uses ultraviolet technology and state of the art design to treat on-board water. Developed for higher flow capability and with a flow rate of up to 4 US gallons per minute, the IWG-UV1 incorporates all new electronics and full monitoring to integrate with the most advanced water system control or cabin management system. The new IWG-UV1 units are vertically positioned to purify all water at the tank exit and a second unit can be fitted, to provide additional treatment if required, just before the water is dispensed at the point of use by galley or lavatory faucets. UV is the safest, lightest, high-performance water treatment solution for aircraft. This small unit (13.68” high x 9.24” wide x 4” deep) deactivates bacteria or viruses in the water by disrupting their ability to reproduce. Unlike chemical water treatments, UV light doesn’t affect or change the water itself, only any organisms within it. Already designed for the B787 VIP aircraft, the IWG-UV1 meets the most stringent requirements needed for completion centers worldwide. View the IWG-UV1 Unit. Contact us directly to learn more.